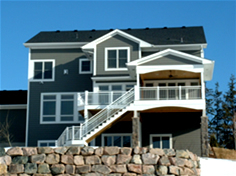 Outdoor Deck Construction | Porch Construction & Deck Designs in Minneapolis, MN | Carver Construction Inc. Carver Construction uses the highest quality materials in the construction of your deck or porch. We are client focused and strive to deliver value and service, no matter the size or complexity of the project. All of our outdoor projects are built to code and guaranteed to last! We specialize in building custom decks, porches, gazebos, and accessories such as arbors, pergolas, benches, and planters. We use natural woods like cedar, pine, and Brazilian hardwoods, as well as maintenance-free alternative products like composite decking and aluminum rails. Treated wood is an environmentally responsible and attractive choice for your outdoor deck or porch. It is a renewable resource and lasts for many years, because pressure treatments protect wood from insects and decay. Treated wood decks have great visual appeal and enhance the natural beauty of your backyard. Whether you want a deck, a patio, a children’s’ play area or an addition to your home, treated wood is a durable, economical and attractive choice. Our composite decking is made from recycled wood and plastic and is an environmentally friendly option. Composite decking is durable, retains color over time, and requires less maintenance than traditional wood decking material. At Carver Construction, we offer extensive years experience in building superbly designed outdoor projects. Each project we work on is designed with your taste and design in mind. This ensures that your deck, patio or gazebo is custom-built to your lifestyle. Call us today at (763) 458-0954 for a free estimate, and put our experience and skill to work for you.